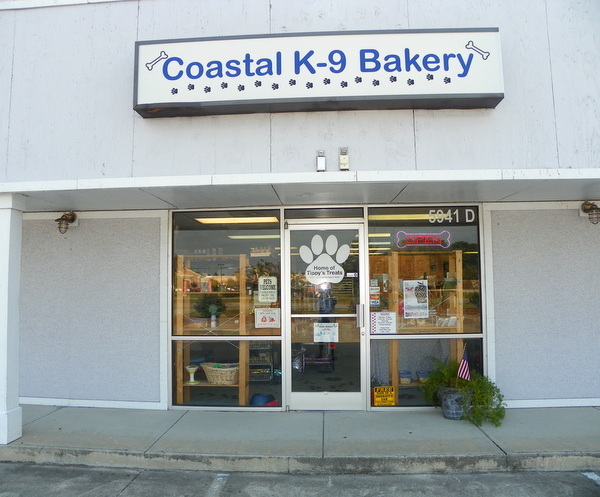 Coastal K-9 Bakery's doors were opened in November 2004 by me, Jackie Oakes. It is my desire to offer to our pet friends the best quality dog treats possible. All of our treats are made of human-grade, organic and natural, and non-GMO ingredients. We add no added sodium, sugars, artificial colors or flavors, preservatives or animal fats or oils in our treats. We offer four flavors: Peanut Butter, Bark-B-Q Ribs, Apple Oatmeal, and Sweet Potato. These recipes are registered with the North Carolina Department of Agriculture, and approved and recommended by local veterinarians, and of course Tippy and Woodie, and our recent addition, Charlie (our rescued lab/golden mix). Presently, Tippy’s Treats can be found in the Harris Teeter stores, Lowe’s Food Stores, Tidal Creek Co-op, and Whole Foods across North Carolina, Tennessee, and Alabama as well as local shops in the Wilmington, NC area. We offer birthday cakes in three sizes as well as “staying in the kennel” cakes, cakes for graduation, births, marriages, new homes, adoption, and even “bark mitzvahs”. We will customize treats and cakes to your desire.